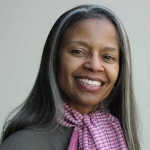 Juana R. Royster, a native of Detroit, Michigan, received her bachelor’s and master’s degrees from Wayne State University, in her home town; and her doctorate from the University of Washington, in Seattle, Washington. Her 1980 dissertation titled “The Academic and Extracurricular Undergraduate Experiences of Three Black Women At The University of Washington 1935 to 1941,” focused on the Pitter sisters. Dr. Royster is faculty member of Washington State University, King County, where she serves as an Extension Health Educator. Former positions Dr. Royster held include: King County Extension Chair; Acting Manager of King County Community Services Division; Snohomish County Extension faculty in Everett, Washington; Camden County faculty for Rutgers, the State University of New Jersey; faculty for Florida Agricultural and Mechanical University in Tallahassee, Florida; and Wayne County Community College in Detroit, Michigan, among other fascinating positions. She remains active on several committees and boards at the state, county and city levels. Dr. Royster provides diabetes education workshops to King County citizens who have or are at risk for diabetes and its complications. In 1997, she was diagnosed with this disease. In 1998, Dr. Royster determined, after spending nearly ten years in University administration, she decided she would leave that line of work and devote her life to learning and teaching about diabetes. She works primarily with people of color and other un-served/underserved audiences.